Are you giving your current Year 10/11 previous GCSE examinations as a mock exam? Many schools are doing this so they can find out how they are doing, how they will perform under pressure and how their results will compare to last year’s. But what other data could you get? 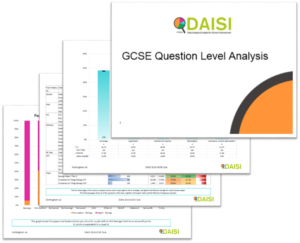 The DAISI KS4 GCSE question level analysis looks at the individual marks scored by pupils for specific questions, and aggregates them up into topic types. and identify key topics for collective improvement.. 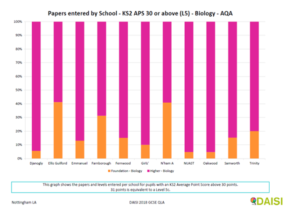 Topics are you performing well in – Where are your pupils going to pick up marks? 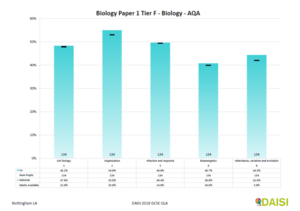 Marks attained per topic – per school, and per KS2 APS band. Full Question analysis – to show which type of question your pupils need to practice. We provide a benchmark assessment of how pupils performed in the subject, identifying strengths and weaknesses and quickly bringing a forensic focus to areas of learning within subject topics for further intervention. Reports ready to share with Assessment Co-ordinators, Senior Leaders, Subject Leaders, School Improvement Partners, Governors and Ofsted. Single page views with clear graphs and charts, simple tables, colour coding and benchmarking against national figures. Each question cross-referenced showing which area each question is assessing. Quickly finds the gaps and topics to focus on – Guiding which intervention strategies are needed. Allows evidence based discussion on the implications for academic results. Additional overarching Multi Academy Trust Strategic Report available. Full Mathematics report – only £150. Full detailed, easy to understand reports – produced within 4 days of provision of data. All Reports sent by secure email. Having ordered your bespoke analysis – You will receive full instructions and a link to our input spreadsheet. Please contact the DAISI Service via daisi@nottinghamcity.gov.uk or 0115 87 64020 to discuss your requirements.